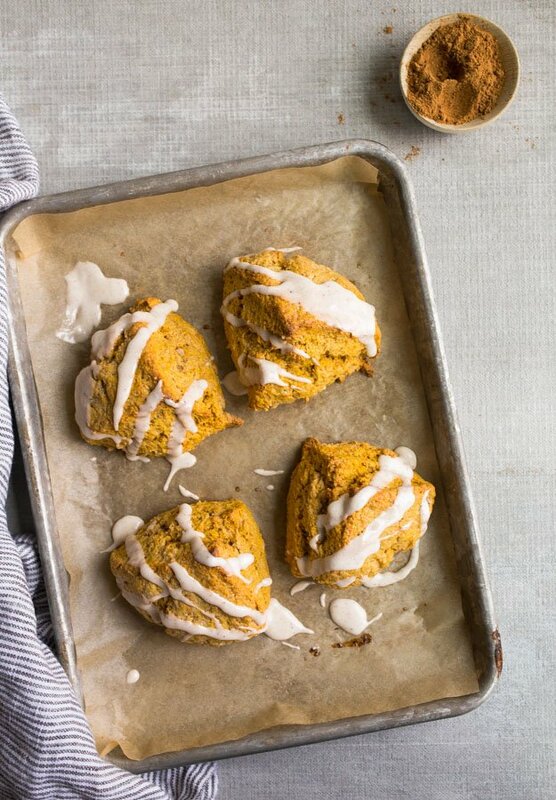 Pumpkin scones for two. 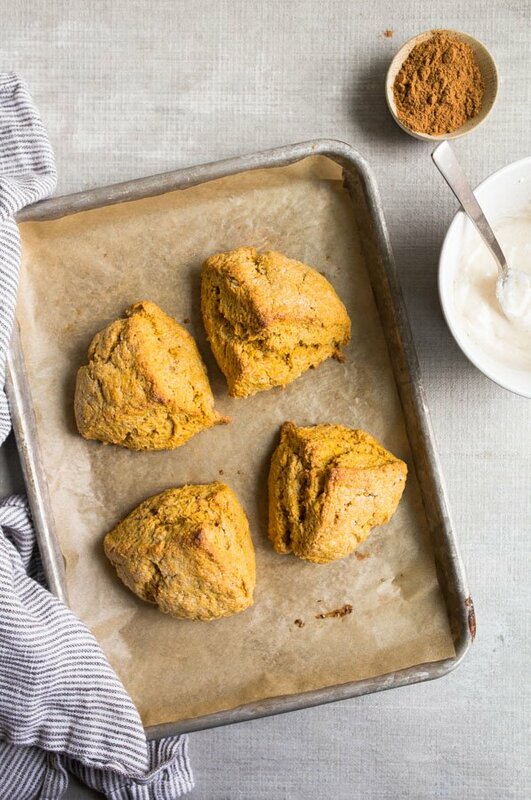 This quick small batch scone recipe is full of real pumpkin and pumpkin spice! The best scones you’ve ever had, because they’re made with all cream and are super flaky! The only time it’s good to be flaky is when you’re a scone. Wait, I should say that biscuits are definitely allowed to be flaky, too. Have you seen my small batch biscuits recipe? A proper scone is made with all cream and a small amount of butter. It should puff up and out in the oven, and crack in a few places, too. While it’s flaky on the outside, the inside of a scone, however, should be soft and muffin-y. I don’t make the rules for scones, friends, I just know how to make them the best way possible. My small batch pumpkin scones recipe makes 4 scones. It’s perfect for a weekday morning when you want a quick breakfast treat. The scone dough is made all in one bowl, and then shaped and cut right on the baking pan. They bake in less than 20 minutes, which gives you plenty of time to clean up the bowls and make the pumpkin spice glaze. These scones, friends. They are the BEST. When I made my lemon scones for two recipe, you guys freaked because they’re light and flaky, just the way they should be! I’m happy to report that the pumpkin scones are just as light and flaky. I had to adjust the recipe because pumpkin is a very wet ingredient. To do this, I reduced the butter and omitted the egg yolk. No flavor was lost, thanks to the addition of 2 teaspoons of pumpkin pie spice. The moisture of the pumpkin replaced the egg yolk. Can you see how much these guys puffed up in the oven? The cracked portion and the crispy bit on the top is my absolute FAVORITE. If you want great scones, don’t use one of those scone pans! Scones need plenty of room to puff up in the oven, and they should have plenty of room around them while they bake. These pumpkin scones in the photo were pushed together for the photo; bake them spaced apart, please. This is my quarter sheet pan, and it has plenty of room to space out 4 scones. 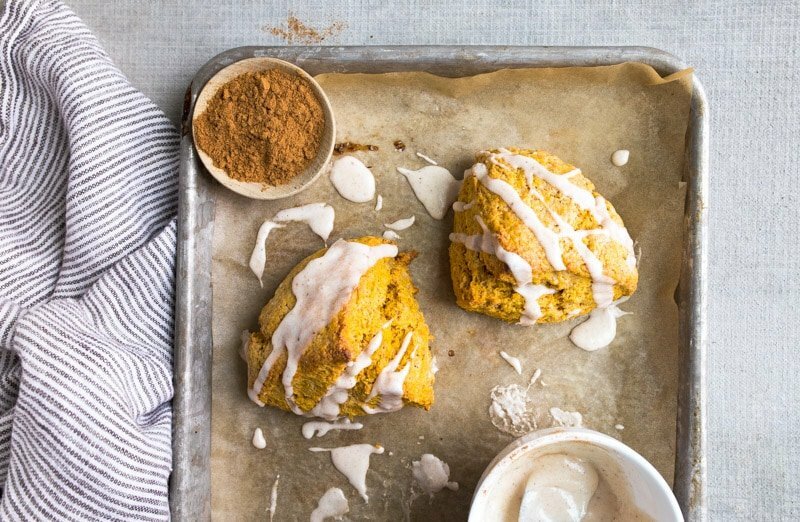 Are these better than Starbucks pumpkin scones? In a word, yes, because the texture is better and they have more spice! I ordered a pumpkin scone at Starbucks to compare, and still, I love this recipe more! Now, every morning, I resist the urge to hand out these pumpkin scones to everyone in line at Starbucks to prevent them from ordering their thin, flat ones! I also love this recipe because it’s not overly sweet–just 1/4 cup of sugar for all 4 scones. The pumpkin spice icing on top brings all the sweetness you need, but in my opinion, the glaze is optional. 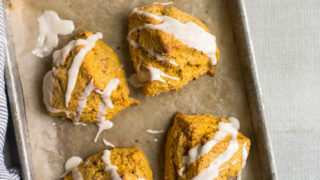 These pumpkin scones are great without icing with a cup of milky sweet coffee. I’m going to hand this recipe over to you, friends, and then let you comment about their deliciousness. 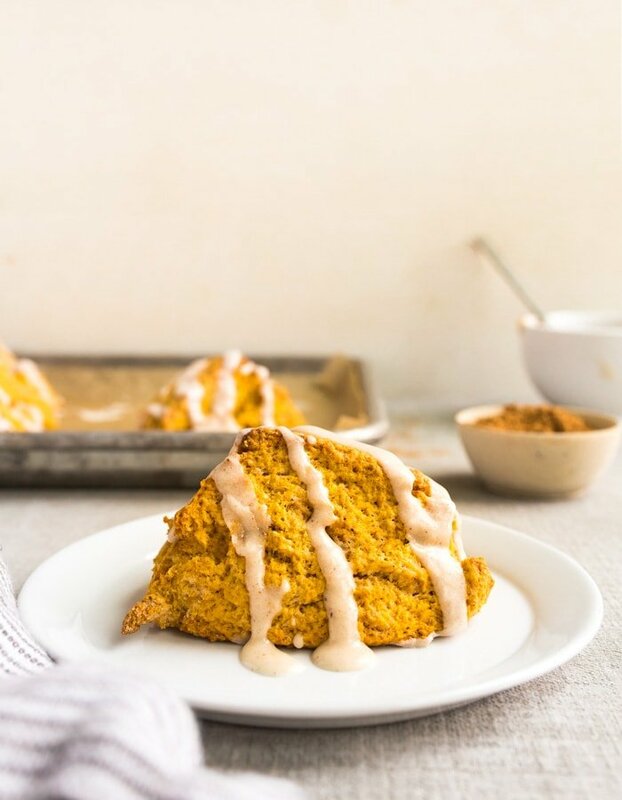 There’s only so many times I can tell you how sweet, flaky, fluffy, tender, spicy and delicious these pumpkin scones are before you think I’m crazy! Before I go, I want to share with you my recipe for homemade pumpkin pie spice that really makes all of my pumpkin desserts sing. Yes, black pepper is the key here! You can also buy pumpkin spice in a jar, but I usually have all of the ingredients in my pantry to make it! Plus, I’m always struggling to use up my spices before they lose their flavor. If you make these pumpkin scones, let me know on instagram. 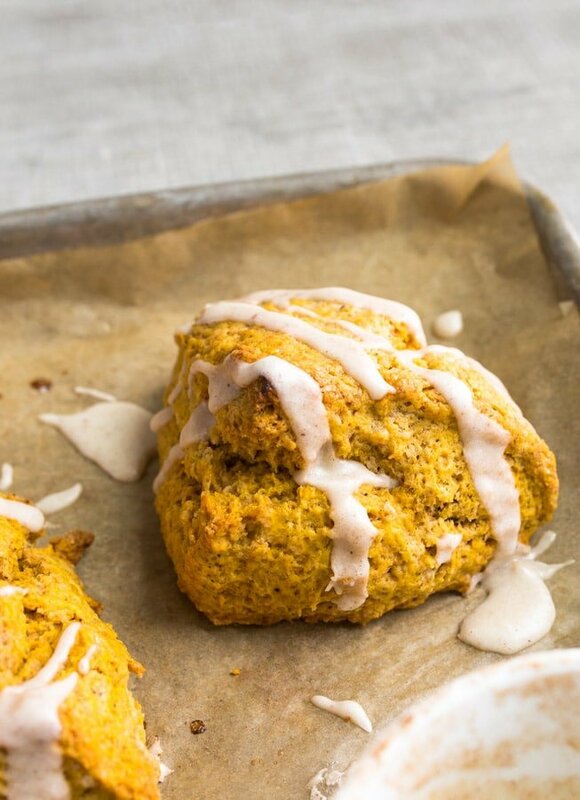 Pumpkin scones with pumpkin spice glaze. In a medium bowl, stir together the flour, sugar, salt, baking soda, baking powder, and pumpkin spice. Next, add the pumpkin and heavy cream in a small bowl and whisk together. Pour this on the flour mixture and stir until a shaggy dough forms. Don't overmix, but incorporate things well. Shape the dough into a disc 5" in diameter. Slice the dough circle into 4 even pieces. Brush each piece with extra heavy cream. Bake for 16-19 minutes, until a toothpick inserted comes out clean and the scones are lightly brown on the edges. wonderful, especially with butter and honey! Yay, Betsy! thanks so much for sharing! Made the dough last night and put them in the fridge. Popped them in at 7 this morning and had the best autumn breakfast anybody could want! Made my husband jealous (he’s not a pumpkin lover, which means more for me!) so I’m headed into the kitchen to make lemon scones. Thanks for the awesome recipe! I was skeptical on the black pepper, but you are totally right. The spices are perfect. My hubby is usually skeptical when it comes to pumpkin snacks, but with these, he asked for seconds! I had to make a second batch so I could have breakfast in the morning for at least a couple of days. Delicious, and so easy! Made these this morning. Had to keep looking for the eggs which are not needed. I added about 1/2 t of vanilla extract and about a teaspoon of sour cream. I put them in the refrigerator for about 20 minutes while I worked the crossword puzzle. I had separated the sections by about an inch. They really puffed up and out with delightful cracked crusts. I separated them at 19 minutes but they were a little raw looking where they had joined so I stuck them back in the cooling oven for another 5 minutes. Wow! They came out light with a delightful crust on the outside. I made the homemade spice blend and it was perfect. Really great recipe…even if you did leave out the eggs. I just made these. They are incredible! The pumpkin spice takes these to a whole new level! The black pepper adds a little bit of heat and the flavor is to die for! Here’s what I did to make them even better. Instead of canned pumpkin I used fresh, steamed and puréed. Instead of granulated sugar I used raw cane sugar or sugar in the raw that has larger granules. It didn’t dissolve completely and added a little bit of crunch on the outside and bottom while the inside is soft and fluffy! Thank you for this recipe! The best scones I’ve ever tasted!